The New York City subway system is notorious for its filth and grime, something that was captured well in Jonath Hertzberg’s 2013 video essay, titled Dirty Old New York Subway, which cataloged the trains’ cinematic history. 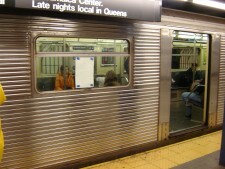 New Yorkers and tourists alike expect to be told about how dirty the Big Apple’s public transit is, so when a group of scientists from Weill Cornell Medical College published a study in February describing just how dirty it was, many people were willing to believe it. Even when they claimed that the causative agents of the plague (Yersinia pestis) and anthrax (Bacillus anthracis) were found, some didn’t bat an eyelash (not us though). Now comes news that the researchers are backing down from their more extreme claims and have toned down their language some. They aren’t issuing a retraction, because as they state their data have been verified by others, but they don’t claim the plague is lurking on the A train anymore. Where they went wrong is that they equated genetic markers with organism presence. The problem with using genetic markers, or plasmids (as was the case for the plague) or fragments of genes (as was the case with anthrax) is that there is so much commonality between organism genomes that unless you are looking at differences at one very reliable, specific gene/location (like the 16s gene) or you have the whole genome to work with, you run the risk of making false identifications. Keep in mind 50 percent of the banana genome is identical to the human one. Then factor in the idea that the authors also reported that half of the bacterial DNA found on the subway did not match a known species, and also that they found more DNA from 2 non-native New York insects than human DNA, it’s a wonder they didn’t issue this correction sooner. The reality is that there is too much overlap in genomes across the entirety of the tree of life to really make serious claims like the ones the authors initially made. There is also still too much we don’t know about microbial diversity and genetics. In fact in many fields of microbiology scientists use something called “operational taxonomic units” in which they lump groups of genetically similar bacteria together because their genomes are very similar, but they aren’t sure enough to tag them with an official name. It’s a very helpful tool when attempting to describe the diversity of microbial life in a particular environment, which is what the authors were attempting to do here, so it’s a wonder as to why they didn’t elect to do that in the first place. Republished with permission from the American Council on Science and Health. Read the original here. Why Is A Universal Flu Shot So Difficult To Make? How Will Anti-Science Activists Treat GMO Humans Of The Future?